I’ve always loved reading books and watching movies that are set in another time and place, I also love all things magical and fantasy related, so it’s no wonder that visiting a magical place like Scotland was high on my wish list! Most of our Scotland trip was spent in the charming city of Edinburgh, but we did spend one day driving into the Highlands, and when they say Highlands, they really mean it! Driving along it seemed as though the hills suddenly rose up out of nowhere. It’s stunningly beautiful and the way the mist creeps and slides down over the hillsides makes everything seem very mysterious and magical. Our first stop was Stirling Castle and while not exactly in the Highlands, it is on the way! Stirling Castle was the home of such notable figures in Scottish history as Marie de Guise, Mary Queen of Scots, her son James the VI, and many other important figures. The Castle was also the location of major battles led by William Wallace against the English troops in the War of Independence . Stirling has a number of wonderful exhibits including a special area just for younger children where they can dress up in period clothing and learn about castle life. Throughout the castle you’ll find people dressed in costume representing figures from the castle’s history. They’ll answer questions and tell you all about themselves. Elliot especially loved “meeting” Marie de Guise, the mother of Mary Queen of Scots, and learning about her magical unicorn horn. The gardens are extensive and if you take a walk along the castle walls you’ll find amazing views of the valley below. If you get hungry they have a number of food options and there is also a lovely gift shop. 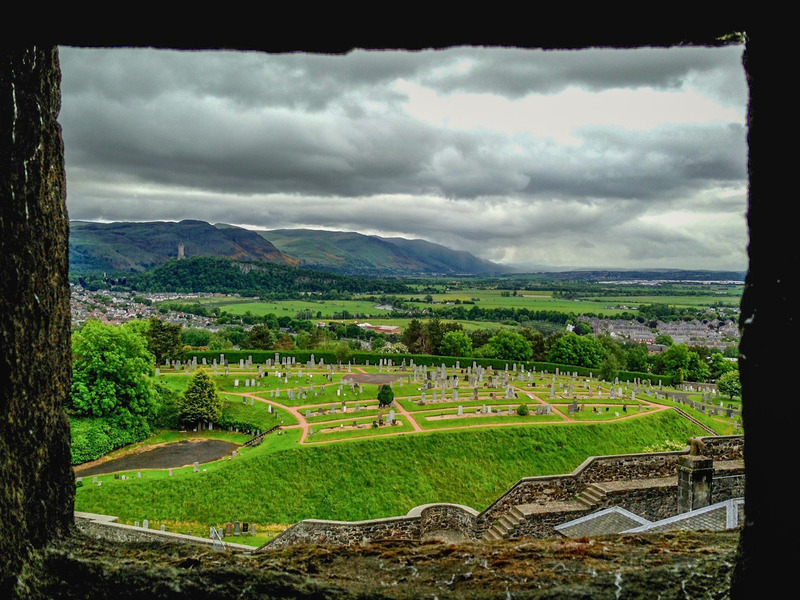 Across the Forth River from Stirling Castle is the National Wallace Monument, in fact you can see it from the walls of Stirling Castle. William Wallace is a national hero and the movie Braveheart is based on the part he played in Scotland’s War of Independence over 700 years ago. The monument itself is located at the top of a hill and there is a lovely wooded trail if you feel like a walk, or there is a bus that goes back and forth. The main attraction inside the Monument is Wallace’s sword which is 5 feet 4 inches tall! That’s taller than me!! There is access to the very top of the Monument and the views from up there are spectacular! We “met ” William Wallace during our visit and he was kind enough to tell us his story. The sword is 5’4″ tall! Our next stop was a beautiful forest in Glencoe, Ballachulish which also happens to be the location of 007s home, Skyfall. Their have been many notable movies filmed in this area including Harry Potter and the Chamber of Secrets. How cool! Just up the road is Fort William and although it was raining pretty hard, we walked around the town a little bit before we found ourselves some dinner. We had heard from friends in Edinburgh that langoustines are the thing to eat while visiting Scotland! We had limited time, but there are many things to see and do in and around Fort William. It’s considered the Outdoor Capital of the UK. We drove a bit further and saw beautiful lochs and a fabulous sunset. Had we not been leaving for London the next day we would have loved to keep going and visit the famous Loch Ness, but it was just a bit too far for a one day excursion… Next time!